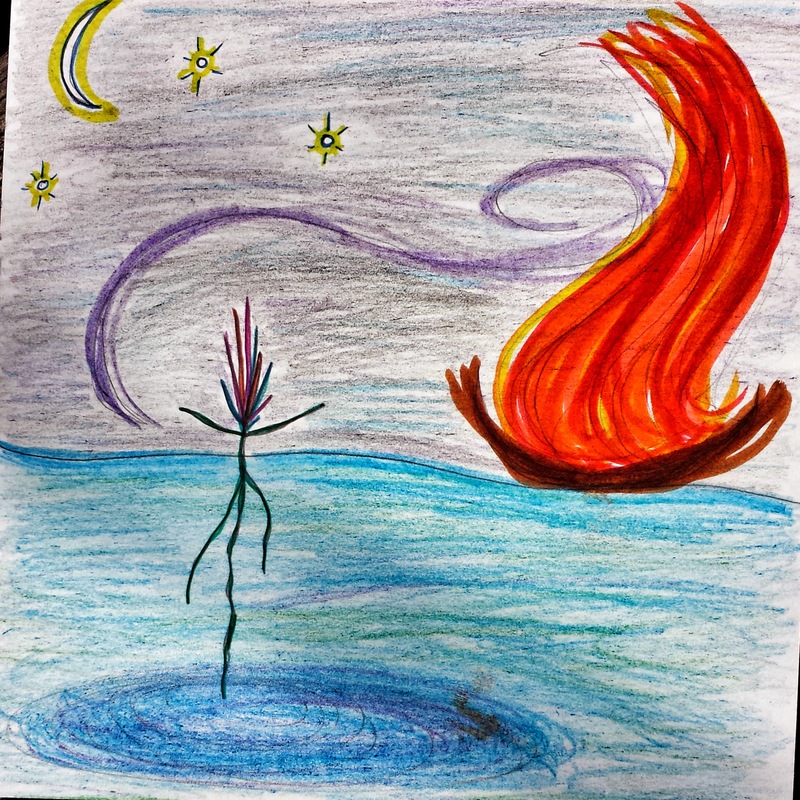 Fire and Water–Best of Friends, or Worst Enemies? 2014 is, in some ways, quite different. But, we’re not out of those watery woods just yet (to joyfully mix my metaphors ;-)). No—we’ve still got those three big hitters (Neptune, Jupiter, and Saturn) hanging out in the three water signs (though that will start shifting, beginning with Jupiter, this summer). And, in fact, we’ll be feeling the effects of another grand water trine—with Chiron joining Jupiter and Saturn—soon. In the meantime, we’ve also got Venus transiting through Pisces (where she is exalted), and meeting up with Neptune this Friday, so dust off those dream journals or get ready to tinkle the ivories—you’ll want to channel that Divine creative energy when it comes tapping on your door. Okay, so , you get the picture. . . All of that water is still in play. I guess that’s not a big surprise. What is making things really interesting right now is the addition of a bunch of FIRE energy, especially over these next few weeks, while the Sun and Mercury are still transiting through Aries. Add to that the fact that we’re in a Wood Horse year right now (not fire—but definitely energy that likes to move quickly!). AND add to that, too, the fact that we’ve got the south node transiting through Aries (FIRE) for the next year and a half, plus the first in a series of eclipses (a lunar eclipse, with Sun in Aries/moon in Libra) coming our way early next week (Monday night/Tuesday morning). That’s a lot of energy, all playing out right now. Add to the mix the fact that we’ve got a Cardinal Grand Cross coming in less than two weeks time (with exact aspects b/w April 20 – 22), and it can be a bit confusing knowing WHAT to do with all of that energy. We know we need to do something, we can feel the changes brewing—but what to do? Good question. . . And one that I can’t answer for you, exactly. But I’ll try and lend some more perspective, so that maybe—just maybe—you might get a handle on how to tease apart the energy a bit more for yourself. So—back to fire and water. You might find it perplexing that I keep returning to these elements, but I believe they hold the key. So, let’s explore them further, shall we? Fire is the element of faith. It’s the element of inspiration, of literally being “lit up” by vision, and passion and purpose. It’s what makes you feel alive. It’s what gives you a reason to fight, or even to wake up in the morning. It’s the energy of desire, and life, and joy. . . But sometimes, it gets too “revved” up, and then it risks gets carried away—or simply burning out. Sometimes, too, in it’s excitement, it can be self-centered, and not see another person’s point of view. Water is the element of deeper knowing, and of connection. Water complements, or contraindicates, Fire’s passion with a sensitive intuition. Water feels—and not just its own emotions. Water feels the needs of others. Water creates bonds. It nourishes. And, at its best, it comforts and heals. . . Sometimes, however, it becomes overwhelmed, due to it’s sensitive nature, and it needs to withdraw to restore and protect itself. At other times, when out of balance, it becomes afraid of losing support, and can become “clingy” or suspicious/mis-trusting. Now you can see why, and how, both fire and water, carry so much charge. Water is the energy that moves inside of us, and that connects us with others. Fire is the energy that swells up inside of us, and that inspires us to action and to larger purpose. 2) The fire causes the water to boil. In the first case, water is acting upon fire (and thus, cooling and vanquishing it). In the second case, fire is acting upon water (which is presumably in a pot), and thus activating it and making it more energetic and expulsive. 3) Therefore—the only other two planets in the basic astrological mix (Sun + planets Venus – Pluto) are Pluto (in Capricorn) and Mars (in Libra). In other words—Pluto is the only earth sign planet (but, being a Scorpionic planet, it has some chaotic and watery elements), and Mars is the only air sign planet (but, being a Firey planet by nature, it will act a bit combustively/assertively). So, how do I recommend that you work with the energy right now? Well, first you need to become more energetically aware. In other words—pay attention to how you feel, what themes are arising in your life and consciousness, how you are currently “reacting” to the energy, and what you may need to bring you back into balance. You’ll know that the energy of water is overly strong within you if you feel very cautious, or depressed, or ruled by fear and attachment. 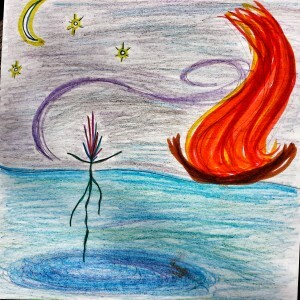 Conversely, you’ll know that the energy of fire is strong if you become easily exuberant, manic, pushy/overbearing, excitable and/or “carried away” (especially by some new vision that has flared up out of nowhere, or that you know that you “must share” “right now”). Now, don’t get me wrong. Comfort (water) is good. And so is passion (fire). But you’ll want to find proper channels for this energy, so that you can maintain consciousness and awareness, and not be overwhelmed/over-ridden by it. Some good outlets include physical activity (great for channeling the fire energy), intuitive-creative practices (such as automatic writing/drawing, dancing or playing music), and divination work (such as Runes or Tarot—great for joining fire vision and water knowing). I also strongly recommend doing some meditative work at the time—for example, Shamatha/mindfulness meditation. Remember that the “missing” elements, here, are air (detachment/objectivity) and earth (stability, groundedness, practical details). Mindfulness practice is an excellent way to stabilize your mind (air) and to bring it in relation to the body (earth). Contemplative movement practices such as yoga or Tai Chi—especially practices that emphasize slow, mindful movement—could be helpful and balancing as well. Similarly, listening to the needs of your body in relation to food, movement, and rest is essential right now. Finally, don’t forget to “talk out” any conflicting emotions with a loved one, or with a trusted advisor—even with your trusted journal. 😉 Remember that all of this Aries energy is ruled by Mars in Libra, so getting another’s perspective, or just trusting the act of sharing, is so necessary right now. So is the act of listening. Above all, listen to the wisdom that arises—from within, from your practices, from your guides, from your friends and loved ones. This is a wonderful time of change and growth, but you also need to find stability in your mind and comfort in your heart. You CAN find the guidance that you need, if you are willing, from time to time, to go within—or just to pause, and listen. This entry was posted in Astrology, Healing/Energy. Wonderful. Thank you. Very helpful and clear. WOW! That’s a lot for a “newbie” like me to absorb, but it’s clear to me that when fire and water mix, whether to extinguish fire or boil water, it produces STEAM…a powerful force that when contained can move miles of heavy freight. Poetically (or energetically or metaphorically) speaking, that mix of simple science and star-systems is what I’ll keep in mind as I feel these energies begin to flow! Thank you!!! Thank you for your thoughts/reaction, Donna Marie! (I know that was a very technical post, though I made a point to come back to an energetic “bottom line”.) I absolutely agree about the steam (which actually “arose” in one of my automatic drawings the other day). So, yes, how you work with the steam is very important: Does it keep building? (Does the water boil and the lid blow off?) Can you channel it? Do you have a way to “let off steam”? Good visual and experiential metaphor.